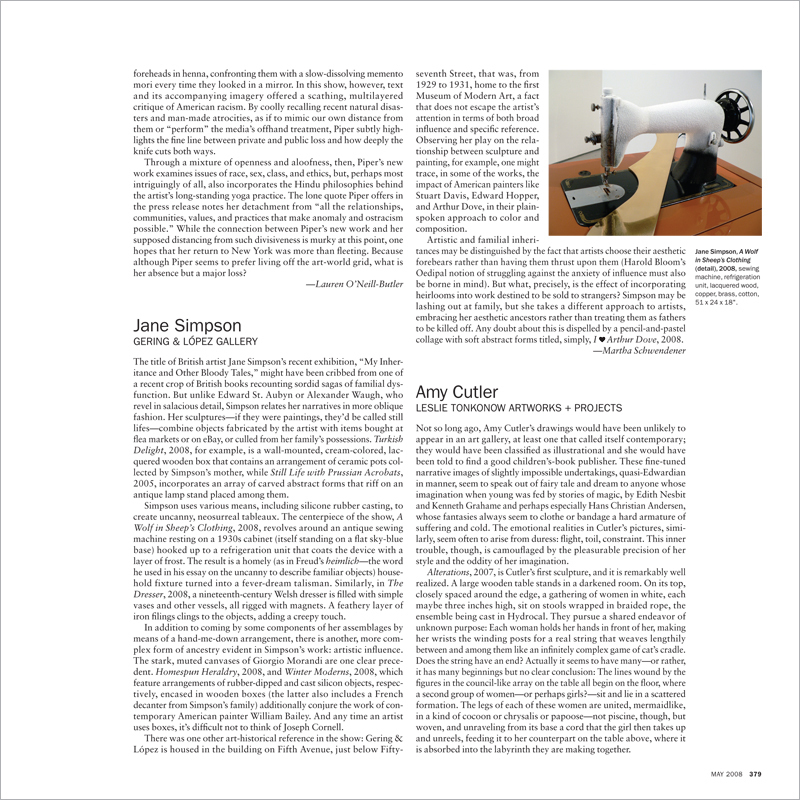 The title of British artist Jane Simpson’s recent exhibition, “My Inheritance and Other Bloody Tales,” might have been cribbed from one of a recent crop of British books recounting sordid sagas of familial dysfunction. But unlike Edward St. Aubyn or Alexander Waugh, who revel in salacious detail, Simpson relates her narratives in more oblique fashion. Her sculpturesif they were paintings, they’d be called still lifescombine objects fabricated by the artist with items bought at flea markets or on eBay, or culled from her family’s possessions. Turkish Delight, 2008, for example, is a wall-mounted, cream-colored, lacquered wooden box that contains an arrangement of ceramic pots collected by Simpson’s mother, while Still Life with Prussian Acrobats, 2005, incorporates an array of carved abstract forms that riff on an antique lamp stand placed among them.